My kids love to read and they especially get a kick out of jokes and picture puzzles. The book Amazing Cows by Sandra Boynton is right up there alley with very cute cow inspired stories, jokes, poems, illustrations and more. Sandra Boynton has more than 40 best selling children’s book and has designed over 4000 greeting cards, now she is ready to move on to some Bovine humor… and she did with this wonderfully illustrated book, filled with colorful and happy images that are fun for all ages. 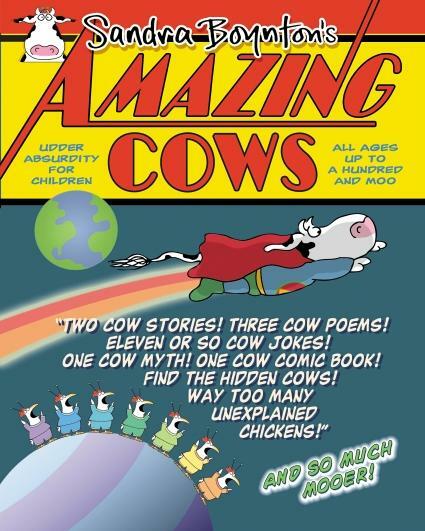 Amazing Cows also comes with a free download of a totally kooky and some may consider irritating orchestra of kazoos; my kids got a kick out of this, but we are pretty silly around here. I found 34 bovine beauties, how many cows can you find? I think this is a great book to read for your kids they will have lots of fun.